Goose Creek is a tributary of the South Fork of the Smith River in Northern California. 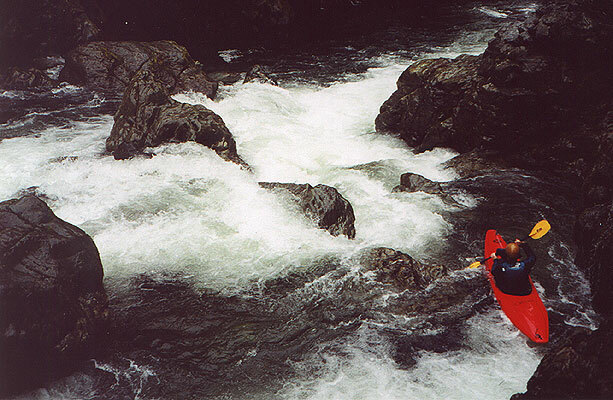 This classic run winds it's way through a deep, spectacularly scenic canyon with lots of small drops and several unforgettable class IV-V rapids. Easy scouting, a pool-drop character, and crystalline water in a pristine setting make this creek well worth dipping a paddle into. John and I ran Goose on the second day of our winter 2000 road trip to Northern California. 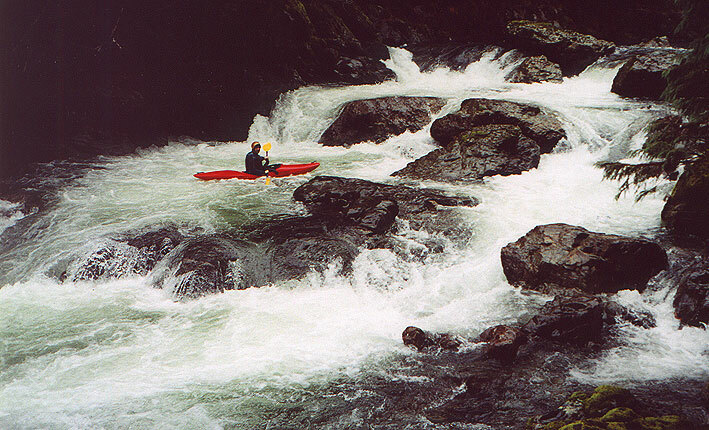 We had just done a medium-high water run down Patrick Creek the day before and we ready for something more demanding. It had rained four inches in Crescent City a few days before and so we had plenty of water..
That night we camped on the South Fork near the take out and it started to rain again. 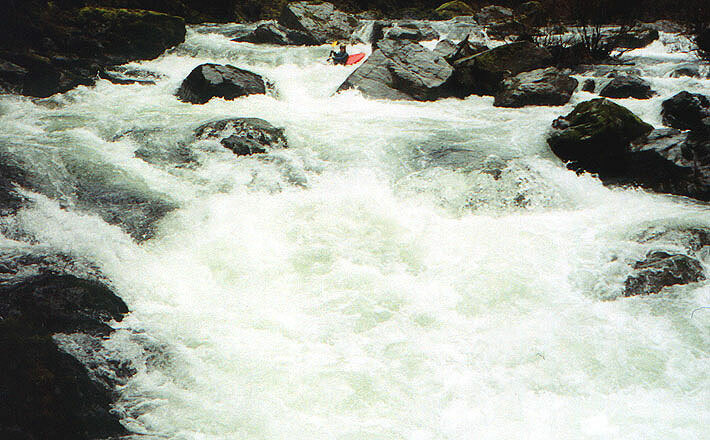 We dug out the Forest Service Whitewater map and wondered what to do. Goose is typically divided into two sections- the 9.5 mile upper (Arn's Falls) run and the lower section, which is 5.6 miles. John wanted to do the whole ~15 miles and so we finally decided to do that after some discussion about flows. We were both a little concerned about having too much water, and the fact that it was pouring the next morning on the way to the put-in did little to alleviate our concerns. Unfortunately, three miles from the Upper Goose access road the main road was gated, so we headed down to do the lower run as the sun began to rise. We got to Saddle Mountain road and parked John's truck at the top. "We have to hike down from here." John said. "The access road is pretty bad." We figured we could hike down to where the road cut near the creek and then bushwhack from there, so we shouldered our boats and headed down the gravel road that dropped into Goose Creek Canyon. Looking down into Goose Creek canyon viewed from Saddle Mountain Road. The canyon zigzags up the center of the image. After walking downhill for about a mile on a very good quality gravel road, I had to say something. "So, John, are you SURE this is the road you scouted?" It seemed very drivable to me! "Ummm..." John peered ahead. "I'm pretty sure it gets bad up here somewhere..."
"Ok..." I said doubtfully. After hiking another half mile on a very good gravel road we just had to laugh about our goof! "Hmmmm- should've gone back and gotten the truck when we had a chance." I said, chuckling. "Aren't we a couple of dorks!" I had no sooner spoken when the road came to a washout which is where we would have had to start hiking anyway! From here it was about three quarters of a mile of easy hiking on the road to get to the creek. When we arrived we were expecting the creek to be big and brown like Patrick Creek had been but to our surprise it was running clear at what seemed to be an optimal flow. What luck! We put on and floated the first mile of mellow class III water, soaking up the scenery and getting the kinks out. Goose Creek canyon is so scenic that it would be worth paddling even if it didn't have some great rapids, which we were just about to find out about... The Forest service map indicated that there were three named drops evenly spaced over the last three miles. The first was 'Gander', the second 'Honker', and the third 'Ugly Duckling'. Soon we reached our first significant horizon line and got out to scout on the right. I assumed this was 'Gander' and we both ran the right side of this great rapid without problems, though we both got big unintenders out of the bottom hole! John at the bottom of 'Gander'. A short distance downstream we came to a very large horizon line and we scrambled out of our boats to scout on the left. Below us was a large, three part class V rapid that had to be 'Honker'. John drops over the first ledge on the two-part class V rapid known as 'Honker'. This line is a little thin as you essentially land next to the large undercut boulder in front of John. A swim here would be grim as there is no way to set up a rope and the hole is backed up by the undercut boulder. John approaches the bottom drop on Honker. The ledge pictured above is in the upper left hand corner of this photo. 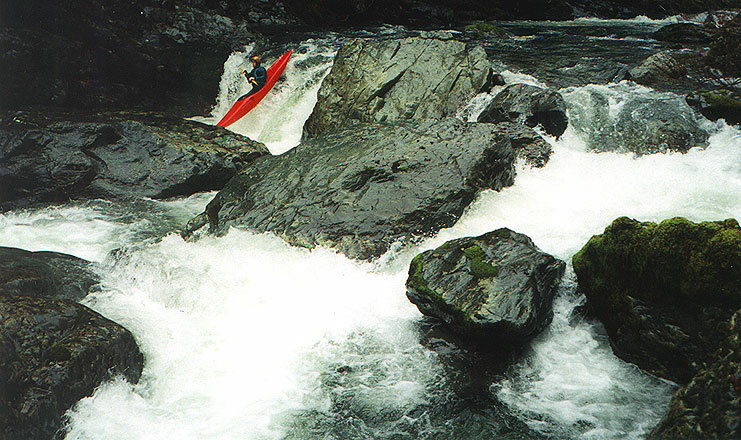 This is the bottom drop on Honker- the boulder jumble in the middle of the creek is easy to avoid, so long as you are in your boat. Downstream were many smaller drops until we got to another large boulder garden just above the confluence with the South Fork of the Smith. We scouted on the right and determined that we had arrived at 'Ugly Duckling'. Here the current funnels down into a big, nasty looking boulder that has serious pinning potential. John went first and charged left to right above the rock without trouble, while I stayed on the right side with similar results. Below here is one last class III rapid above the confluence with the South Fork of the Smith- from there it was a mellow half mile float to the take out bridge. 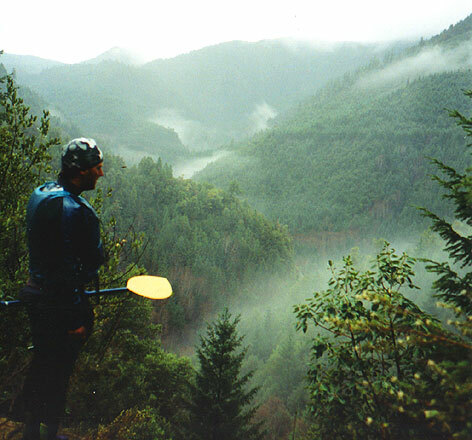 Character: Remote, scenic run with pool drop rapids in a deep canyon. Gradient: Drops 50 feet in the first mile, then averages 103 fpm for the next four miles. Access: From Grants Pass take Hwy 199 east for about 70 miles until you reach South Fork road, which immediately crosses the Smith River. Stay on South Fork road until you come to the take out at Steven Bridge. Cross the South Fork and continue up South Fork road for a mile or two, looking for the next bridge across the SF Smith, which should be the next right hand turn. This is Forest service road 15 and there should be a sign before you cross the bridge for Red Mountain. After you cross the bridge follow FS 15 for 2.6 miles until you come to Saddle Mountain Road on the right. (There is a large clearing here, and on one side some of the locals have set up a shooting gallery.) There are two roads exiting the clearing here- stay left (going downhill) and drive for about 1.5 miles on a very good quality road until you come to a small washout. A four wheel drive truck might be able to make it past here, but if not it is a very easy three-quarter mile hike down the road to the creek. You might want to bring a saw for Saddle Mountain Road- we encountered a couple of small trees across the road on our way down. Gauge: None. Requires several days of heavy rain.